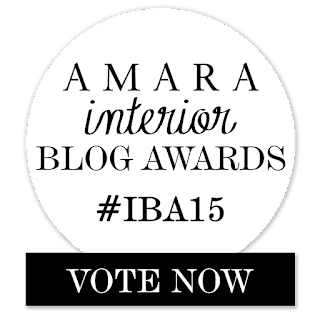 Thanks to some lovely soul I have been nominated for an Amara Interior Blog Award and the voting for nominees is now open. I'm in the DIY and Craft category and I have to say there are some amazing people present in that category so I'm honoured to have made it into their midsts. But in an effort to not fall flat on my face in the voting I'm wondering if you might like to pop over to their site and vote for me. The top 5 go through to the final stages and it's tough competition so I'm not expecting my face to be there but it would be lovely it was! Click the image above or here to go through to my voting page. Thank you in advance for your lovely help!